The Sexual Harassment Is Illegal Notice is an equal opportunity law poster by the Vermont Department Of Labor. This is a mandatory posting for all employers in Vermont, and businesses who fail to comply may be subject to fines or sanctions. This poster must be posted in a conspicuous place by all employers so that all employees can see it. This poster describes what sexual harassment is, how to report it, and consequences for those who commit sexual harassment. It appears you don't have a PDF plugin for this browser. 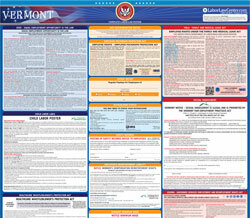 Please see the link below to download vermont-sexual-harassment-is-illegal-poster.pdf. PERFORMANCE OR CREATING AN INTIMIDATING, HOSTILE OR OFFENSIV E WORK ENVIRONMENT. SEXUAL HARASSMENT OR FOR COOPERATING IN AN INVESTIGATION OF SEXUAL HARASSMENT . COMPLAINT OR SUSPECTED ACTS OF SEXUAL HARASSMENT. The above -named individuals can also provide copies of this employer’s written sexual harassment policy.